You've read about the afterlife. We love to see people who have grieved for years dry their tears and smile because now they feel certain that their dead loved ones are okay and not lost to them forever. We love to witness anxious parents-to-be relax because they have met their not-yet-born children. They are more confident now because they know more about how to bring them up in a way that respects each child’s unique spiritual and emotional needs. We hate for people to suffer from the profound loss of a loved one’s death, or the confusion and frustration of parenting a complete stranger. We hate to watch them go from expert to expert yet remain inconsolable or bewildered. According to Raymond Moody, M.D.,author of Life After Life and other bestsellers, this is “too important to leave to science.” He means the question of consciousness surviving the physical body (the afterlife), and the profound impact that the search for answers to this ultimate query has on our well-being. Win a prize worth $1,791! Sign up to be eligible to win a free Meet Your Guides Method program and personal meditation during the launch of The Healing Circle--How Anyone Can Contact the Other Side. 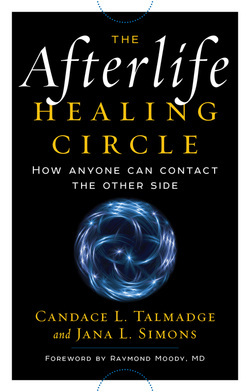 That is why Candace L. Talmadge and Jana L. Simons wrote and published (New Page Books) a spiritual self-help book called The Healing Circle--How Anyone Can Contact the Other Side. Based on our decades of experience with this loving, uplifting spiritual practice, we know it can bring relief and hope to you and countless others. We have experienced and witnessed its profound positive effects even though science cannot yet understand or explain how the healing circle works. Our little book teaches how, when, where, and why to conduct the healing circle safely and successfully. It puts the power in your hands to experience the reality of life beyond the physical and make up your own mind about the other side. Please buy and read this book. Gather some loved ones and practice the intuitive skills it outlines. Then experience the afterlife healing circle for yourself and decide….